Growing up playing hockey as a female, it was never “I want to make the NHL”. My goal was always “I want to play for team Canada”. However, when injuries took me away from the game, that dream slowly faded away. Knowing that I always wanted to stay involved in the game, an undergraduate education in Kinesiology and eventually a Doctor of Chiropractic degree would get eventually get me to my goal – just not in the position that I had once thought. This past December I was chosen as the team medical for Team Canada East at the World Junior A Challenge (WJAC). If you aren’t a player, parent, or work in the Jr. A world, you are probably not familiar with the Jr. A League, such as the Ontario Junior Hockey League I work in with the Georgetown Raiders. These players are elite athletes playing the highest level of hockey available to them, while still keeping their NCAA eligibility; as opposed to playing for a team in the OHL or QMJHL, where players’ NCAA eligibility is lost. So essentially, the WJAC is Jr. A hockey’s version of the IIHF World Juniors. The players chosen to Team Canada East have NCAA commitments to schools such as Princeton, Vermont, St. Lawrence, and Penn State to name a few. Some have even been drafted into the NHL draft. They were chosen because they were the best of the best out of the 5 Leagues which make up the eastern portion of the Jr. A leagues. The 17-day journey began with a gruelling 4-day camp. Forty-four players from the 5 leagues were invited, and ultimately our roster of 22 players was decided on. 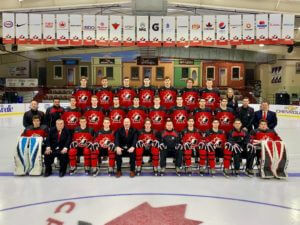 These players flew to Edmonton and then took the 3-hour bus ride to Bonnyville in North-East Alberta where they joined the 4 remaining WJAC teams – Canada West, Russia, Czech Republic, and the United States. My position as team medical meant that I was available to the players any time of day for whatever they may need. Whether it was a pre-or post-game stretch, acupuncture, the ever so popular cupping, a late-night snack, bottle of water, or even just to have a chat about how they were playing or what may be bothering them. Whatever they needed, they found me. My hotel room became a medical triage centre, the snack room, and the hangout lounge (we watched Ice Age multiple times) for the 13 days we spent in Bonnyville. Although the days were long, the food not great, and we didn’t have the results in the tournament we had hoped for, it was one of greatest experiences of my life. The staff and players were amazing to work with and we created bonds and relationships that we will have forever. The most memorable moment for me was watching the players for the first time walk into the dressing room and see their jerseys hanging up in the stalls with the Canada logo on the front and their names on the back. They had worked so hard to get here and the looks on their faces is something I will never forget. Although it wasn’t my name on the back, having the opportunity to be a part of a team like this, help our players represent their country, and get through one of the biggest tournaments in their young careers, is something I will forever be grateful for.